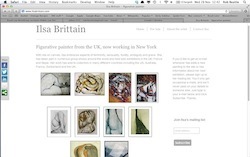 Something slightly different - a pop-up website if you will. We found the domain, registered it, sorted out the hosting, designed the site and had the whole thing up in just over 24 hours. The centrepiece is a Flickr gallery which displays on two pages and allows the artist to update the content herself whenever she pleases. There’s also a Mailchimp form so that visitors can sign up to receive new whenever Ilsa adds a new painting to her collection and the whole thing is wrapped in another excellent Themeflood theme.